Camping in the national forest and parklands around Cody, Wyoming offers the vacationer some incredible opportunities at outdoor recreation, fascinating historical sites and spectacular mountain vistas. What you expect from your National KOA campground. Full activities and amenities avaialibe. Open May through September. There are numerous camping options in and around Cody, Wyoming that make it the perfect western vacation. You’ll find places to set up a tent or pull in your RV in some outstanding places like Buffalo Bill State Park, Shoshone National Forest, Washakie Wilderness Area and Yellowstone. Buffalo Bill State Park is located just 8 miles west of Cody, Wyoming along the road toward Yellowstone National Park. Campsites come equipped with tables and grills and facilities include restrooms and water spigots. There are no utility hookups or showers. The majority of the sites within these two campgrounds are available as first-come, first served. There is a 14-day maximum for length of stay. - North Shore Bay Campground: located about 9 miles west of Cody, with 37 sites. 29 are pull-through, 3 are back in, and 5 are designated for tents only. - North Fork Campground: located approximately 14 miles west of Cody, there are 62 sites, with 56 pull-through and 6 tent sites. Campgrounds are generally open from May 1st through September 30th. For residents of Wyoming, camping fee is $10-$15 and for non-residents the camping fee is $17-$22. Find more information on the Buffalo Bill State Park Website. There are many campgrounds within the Clarks Fork, Greybull, and Wapiti Ranger Districts in the Shoshone National Forest that are within close proximity to Cody, Wyoming. A 16-day maximum is allowed for length of stay. - Big Game Campground: 29 miles from Cody with 16 sites. 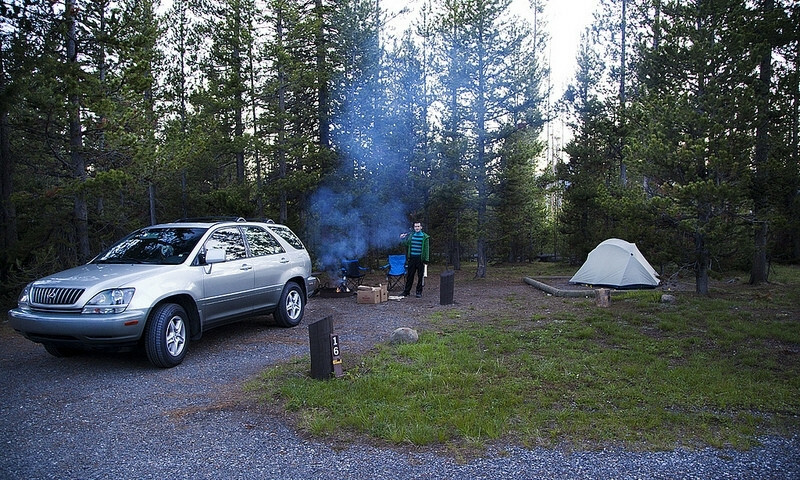 - Elk Fork Campground: 29 miles from Cody with 13 sites. - Wapiti Campground: 29 miles from Cody with 41 sites. - Clear Water Campground: 32 miles from Cody with 32 sites. - Rex Hale Campground: 36 miles from Cody with 30 sites. Generally the open season for campgrounds with services (water on, garbage pickup, etc.) begins with Memorial Day weekend and runs through the end of September. All sites are available on a first-come, first-served basis with campsite fees ranging from $5 to $15. The Washakie Wilderness area of Shoshone National Park is located only 30 miles southwest of Cody and offers primitive camping. There are typically no services available. You may occupy a single location for no more than 16 consecutive days. There are no developed campgrounds within this Wildernesses area, but dispersed camping is permitted. The best times to camp are from Memorial Day weekend through September. There are no fees associated with camping in the wilderness area. The closest entrance station to Yellowstone National Park from Cody, Wyoming is the East Entrance. From July 1st to Labor Day, the maximum length of stay is 14 days. The rest of the year, you may stay up to 30 days. However, there is no restriction on length of stay at Fishing Bridge RV Park at any time. - Fishing Bridge RV Park: Hard sided camping units permitted only (no tents). - Bridge Bay Campground: RVs and tents welcome. These campgrounds are open from mid-May through most of September. Norris Basin is located in the northwestern part of Yellowstone National Park. Campground located at the south entrance to Yellowstone. Located on the shores of Yellowstone Lake in Yellowstone National Park.